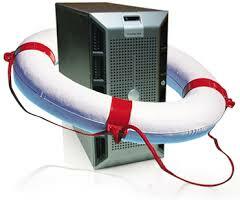 Our disaster recov ery plans are more than just checking your backups are working. Our three tier-disaster recovery plan is a mixture of audit, recommendation and peace of mind that in the event your server dies, your operations can be recovered and within a time-scale that won’t destroy your business. If you’re already an Opus Support Customer then you’re entitled to a free test restore based on a sample of your data and a basic disaster plan outline. You may also qualify for a 50% six-month discount on our Cloud Backup solution which holds your data off-site for disaster recovery purposes. This report is available free to our current support customers and gives estimates for how long it takes to get data back on to a single laptop, how long to get email flowing again and then how long it would take to get all the data restored and multiple users up and running again. It identifies some procedures and products that can be used to help mitigate downtime in the event of a disaster. To produce this document we sit down with an IT contact and go through the outline steps needed to get the business to a state when it can operate again. It talks through obtaining replacement parts if necessary and what needs to be done with backup media to ensure the quickest restoration of service. The document covers areas which could be improved to speed up and increase the chance of a complete restoration with no data loss. This document is produced over a two day period. This document incorporates all the features of the standard disaster recovery document but also identifies key personnel in both your and your supplier’s business. Along with phone numbers and any account numbers, this document tells you who to contact and in what order. It also identifies which pieces of information are the most critical to you and draws up a full restoration plan for recovery from four different type of disaster from hard drive failure through to complete destruction by fire. This document is produced over the period of a week. Your company will most likely have a backup solution but not all companies are confident they are backing up the right bits of information or that it would ever restore if needed. We can talk you through your data and help decide which directories are vital and which are just taking up space on your server. We can also perform test restores for your peace of mind. It’s easy to assume that your phone provider will come and fix the phones, the national grid will provide your electric and your IT company will come to replace your PCs and servers after a disaster but who is it you actually phone to get the ball rolling. We identify key people in your disaster recovery process so you’re not being passed from pillar to post trying to get support whilst your business is down. You’ve got a backup so you can get your data back but what about timescales? Businesses often overlook the time it takes to get that data back from tape so it’s useful to have a disaster recovery document that outlines which pieces of data need to be retrieved first and who needs to receive them.